You can change the placement of icons on your iPhone or iPod touch much faster by moving them around directly within iTunes. 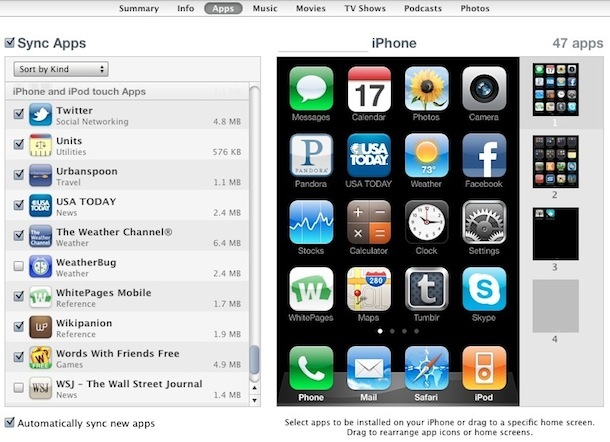 As long as you have “Sync Apps” enabled, your new iPhone home screen and icon placement will be saved. I find this much easier than trying to rearrange lots of icons on the small touch based screen. This even works with jailbroken devices, although the Cydia icon was stubbornly quirky after the limera1n download and kept snapping back to it’s original placement on an iPhone 3G. The title is confusing. I thought it was about changing the icon PICTURES, not their placement. That is possible too, without jailbreak I think, just not for official bundled apps.